Blue mottled glass with red rim. Signed by Chihuly. Dated 1994. Approximately 9 x 11 inches. My parents were personal friends with Chihuly. He gave it to them personally. This is a vintage, 20th century, signed and dated 1994, hand blown studio art glass basket or bowl by renowned American glass artist Dale Chihuly (b. 1941) from Washington State. 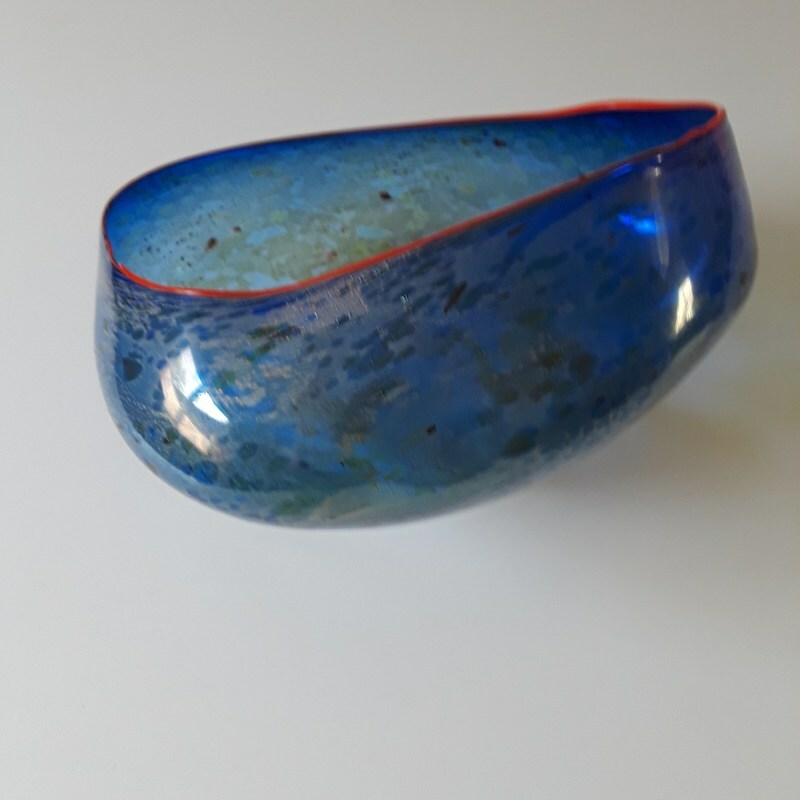 The glass 'basket' is done in a mottled cobalt blue, called macchia, with red lip. The provenance, or history of ownership, is that this was a direct gift from the artist himself. Chihuly began working with glass in 1965 and studied under Harvey Littleton. By 1968 Chihuly earned his Masters of Fine Art from the esteemed Rhode Island School of Design and with a Louis Comfort Tiffany Foundation grant and a Fulbright Fellowship he apprenticed at Murano glass studios in Venice, Italy. In 1971, after his return to the US, he co-founded the Pilchuck Glass School near Stanwood, Washington. His works are displayed in Institutions throughout the world and widely collected. The estimate is based on actual recent past recorded auction sales of comparables. Retail 'asking prices' can be higher and vary. Question for the appraiser of this bowl. I am the owner of this Chihuly bowl. Since the appraisal was completed, we've noticed that part of the red rim on this bowl has broken off. How would this affect the appraisal price? Thank you! I added two pictures of red edge affected. No one ever got back to me. I'm wondering if the appraised value of this bowl is significantly impacted by what appears to be some damage to the red rim. Two pictures attached. Thank you!